Putting aside the neo-liberal talk of 'stability' for a moment, it is interesting to examine the crux of the NO campaign's argument. The ULA refers to it as the 'Austerity Treaty' in most of its literature and Sinn Fein have put out posters bearing the words 'Austerity isn't working; Vote NO'. There are a number of reasons why this is tactically inept; but primarily, to put across the idea that the agenda of the ruling class, the agenda of austerity and neo-liberalism, can be halted by ticking a box is the worst possible message to disseminate. It must be made clear; voting NO to the Fiscal Compact Treaty is not voting NO to austerity. Never will that choice be put to us by the ruling class. Austerity will continue to be administered on us, and our fellow people across Europe, regardless of the outcome of this Treaty. If it was as simple as being able to vote NO to austerity, we would not be offered a choice. What you will be voting NO to is a specific measure which commits member states of the EU to balance their budgets and tightens centralisation of budgetary controls. However, whether austerity is administered by legally binding decision from Europe, or by the compliance of the Irish ruling class, its politicians and institutions, is not really important. To paint our government not as a part of the ruling class agenda, but as poor unfortunates being dragged along by evil Europeans is disingenuous in the extreme. Because ultimately what the ruling class fears is not 51% of the electorate ticking the NO box - its the working class getting involved in mass movements of resistance. What they fear is the working class taking to streets, refusing to comply, and most importantly, organising amongst themselves. The aim of the revolutionary left should not be to instil in the working class confidence in the electoral system, or trust in those nominally "above" them, it should be to instil in them confidence in their own power. Contrast the NO Campaign with the Anti-Household Tax campaign. Without the consistent and vigorous participation of thousands of people across the country, CAHWT simply could not function. Already CAHWT is the largest boycott in this country since the Land League in the mid-19th century. More people are boycotting the Household Tax than voted for the government. Within the campaign, we are already seeing direct democracy in action, and for the first time in this country, there is a mass movement against austerity. The skills being learned by those involved in the campaign are invaluable - tools that are vital to any form of community self-organisation. Through the campaign, we are seeing real resistance to austerity. Working class people are giving up their own time to organise in their own communities, people are refusing to accept this aspect of austerity, and are organising to fight back. 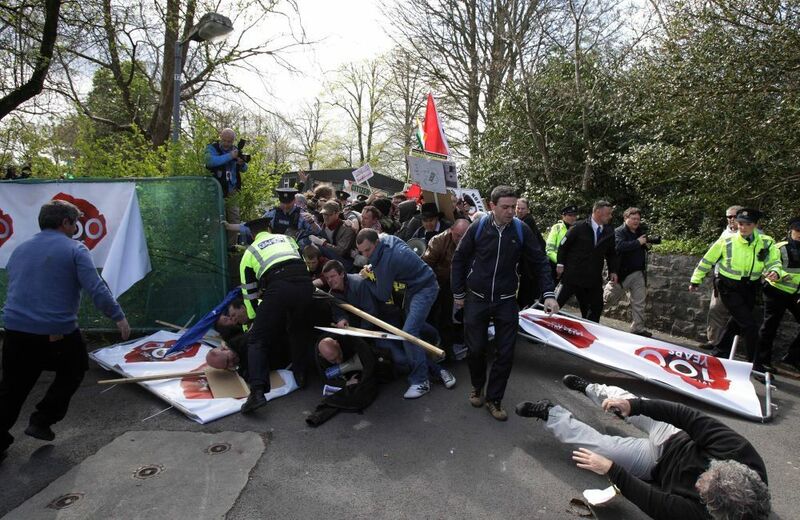 Already, we have seen a CAHWT protest smash through several lines of police barricades at the Labour Party conference. Networks of people are building up across the country to organise against austerity - it doesn't take much imagination to tie the campaign in with broader anti-austerity or anti-capitalist movements. And yet the NO Campaign puts forward, consistently, the idea that austerity can be voted away. Which of these two campaigns will be more effective, and more suited to the aims of the revolutionary left; a campaign which requires very little participation by the working-class (the only action required being the ticking of a box), relies on the clout of politicans in SF and the ULA and ultimately, lies within the realm of electoralism, or, a campaign which builds networks of solidarity and resistance nationwide, shows revolutionary modes of organisation in action, and provides a glimpse of real resistance to austerity? The same real resistance can be seen in a number of campaigns across the country, for example, Free Education for Everyone (FEE) and the campaign against the closure of DEIS schools. While these campaigns are nominally single-issue campaigns, they are part of the broader fight-back against austerity measures. There are two choices in the way we fight austerity. Either we fight on the battleground of the ruling-class - in the polling booths, at the ballot boxes, in the courts etc. or we fight them on our own battleground - in the streets, in our communities across the country. In this referendum situation, the government can bring to bear its heavily-biased media outlet, RTE, the party machinations of two of the largest political parties in the country (FG and Labour) and threats (which are not entirely empty by any means). We are being offered a false dichotomy which only exists within the realm of the ruling-class - vote YES to ‘Stability Treaty’ or vote NO to the ‘Austerity Treaty’. Neither of which will bring about either outcome. One side are campaigning for stability, the other for growth, two mutually exclusive ideas which are systematically problematic. Not that there’s any danger of a NO vote being accepted as a NO to austerity. Either we spin the wheel back to 2007 or we go on living in the Irish version of the Weimar Republic. Simply, we should refuse to accept the choice being offered to us. Instead we should offer them back a real NO - our resistance.